Chandigarh, June 2 : Over 65 lakh tonnes of wheat has been procured in Haryana this season, an official said Monday. 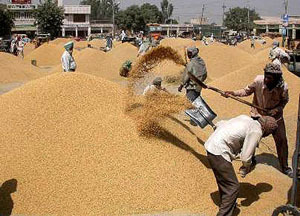 The procurement of wheat this time has been much higher than the 58.74 lakh tonnes procured in the same period last year, a spokesman of food and supplies department said here. Out of the total arrivals, 64.97 lakh tonnes has been procured by government agencies.